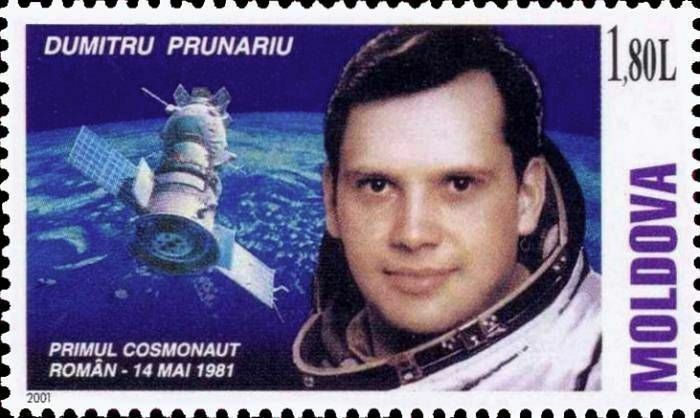 On 14 May 2001, the Post Office of Moldova (Poșta Moldovei) issued a postage stamp with the title 20th Anniversary of the Flight of the First Romanian Cosmonaut - Dumitru Prunariu. The issue comprises one stamp, with an associated cancellation (postmark) and first day cover (FDC). The designer was Vitalie Roşca. The printing was performed by Bundesdruckerei, Germany. Dumitru-Dorin Prunariu (Romanian pronunciation: [duˈmitru doˈrin pruˈnarju]; born September 27, 1952) is a retired Romanian cosmonaut who flew aboard Soyuz 40. Read more.. This article uses material from the Wikipedia article 'Dumitru_Prunariu', which is released under the Creative Commons Attribution-Share-Alike License 3.0.